How did you find Chicken Smoothie? For topics which don't fit anywhere else! Discuss the weather, your mood, hobbies and interests. Please keep all discussion child-friendly. Re: How did you find Chicken Smoothie? 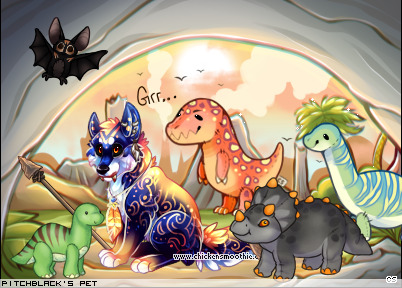 I was just bored and was looking for new pet sites to invade; my "addiction" to Adoptable Pet Sites started with Pet Adoptables (which is awfully quiet now ): ), and then I found Chickensmoothie through there. TELL ME YOUR FAVORITE EXTINCT ANIMALS! my friend told me about it and asked me to play, and so I just said okay! Not too long ago, my friends were talking about the ' pound ' opening, so i decided to join them. hi, i'm pri and i guess i'm kinda active. actually it was back in 2012 i believe? but a friend introduced me. i had another account back then, but no idea what happened to it. My friends started playing a couple years back and I thought it looked fun. <———- Meet Kimora, I was given her because I was an oekaki mod from 2011 to 2016. I have played a game called Animal Jam for a few years, and it has a big Youtube community, and I found a video by an Animal Jam youtuber playing Chicken Smoothie so I made an account. Busy with irl stuff. I will be replying to all roleplays in the morning.